6061-T6 Aluminum CNC machined. Precision bearings. Integrated compression ring design. Higher rise c.. The Mankind integrated headset is a sealed bearing campy style (45°/45°) headset with a laser edged ..
New dust cap design, with Monogram laser etched logo, for a cleaner look to accommodate a taller rid.. The Primo Stevie Headset features a custom CNC shape with a laser etched Primo logo, Stevie Churchil.. 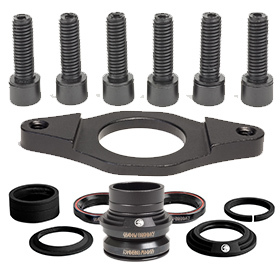 Product DescriptionThe Shadow Conspiracy corvus built-in headset is a light-weight 100% CNC 6061 T6 ..
Replaces existing cap no need to use washers for stacking.100% CNC, 6061-T6, alloy cap23mm stack hei..
100% CNC, 6061-T6 cap Custom Shadow angular sealed bearings with logo and red seals Includes: 2 se..
BITCHIN HEADSET Lightweight 100% CNC 6061 T6 alloy cap Custom Subrosa angular sealed bearing..
Subrosa Forever Stem Gyro Plate Matte Black..
New dust cap design, with Sunday laser etched logo, for a cleaner look to accommodate a taller ridin.. The Sunday BMX headset is designed to be a quality headset at an affordable price. It offers o..